Served with quinoa and tomato concassé. This recipe was devised by Kathryn Holmes, 2013 Up and Coming Chef of the Year winner. Salmon fillet (enough for two people) skinned and cut into one-inch cubes. 1. Wash and rinse the quinoa. Leave to soak in fresh water. 2. Score the tomatoes and remove a small part of the stem, then blanche in boiling water. Place into ice cold water, then dice into small pieces. Mix with the oil and lemon juice and season well. Place to one side until needed. 3. Dice and marinade the salmon. 4. Cook the quinoa on the hob for 15 minutes. 5. Place three salmon pieces on a kebab stick. Heat the grill and cook the salmon kebabs. 6. 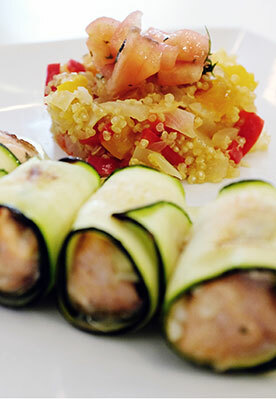 Finely slice a courgette into ribbons, griddle for two minutes on each side and wrap around the salmon. Serve on a plate with a portion of quinoa and the tomato concassé on top.